Workers' relatives came to the facility as word spread. "It's really sad and it makes a lot of people really angry and frustrated," the daughter of a detained worker said. 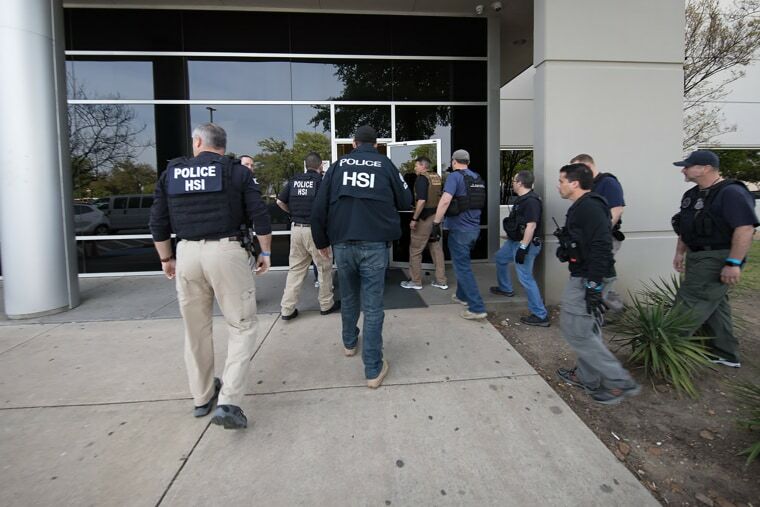 Federal immigration authorities arrested more than 280 employees of a Texas company in what officials said was the biggest single workplace raid in a decade. The homeland security investigations unit of Immigration and Customs Enforcement (ICE) said the employees of CVE Technology Group Inc. in the city of Allen, north of Dallas, were arrested on administrative immigration violations and that they were working in the United States unlawfully. The raid was part of an ongoing investigation into complaints that the company may have knowingly hired people who are in the U.S. without authorization and that many of those workers were using fraudulent identification documents, the agency said. CVE Group Inc. is a New Jersey-based company that refurbishes and repairs consumer tech products and has a national receiving center in North Texas, according to the company's website. The company could not immediately be reached for comment on Wednesday. "Our focus is the criminal investigation," said Katrina W. Berger, a special agent in charge for ICE's Homeland Security Investigations in Dallas. "As far as immigration-related arrests, this is the largest ICE worksite operation at one site in the last 10 years," she said. Relatives of workers came to the facility after word of the operation spread, some emotional and wondering about their loved ones, NBC Dallas-Fort Worth reported. Anel Perez, the daughter of a worker who was been detained, told the station, "It's not fair. It's really sad and it makes a lot of people really angry and frustrated,"
Berger said she could not discuss many details of that ongoing probe but that "the numbers of the administrative arrests we made today hint at the significant scope of this investigation." ICE said that all those arrested would be interviewed "to record any medical, sole-caregiver or other humanitarian situations," and that the federal agency would then determine whether any would be considered for humanitarian release. But the agency also said in the statement, "In all cases, all illegal aliens encountered will be fingerprinted and processed for removal from the United States." Berger said that authorities were still vetting information and she did not have the nationalities, ages or any criminal backgrounds of those taken into custody. ICE said that search warrants were executed at CVE Technology Group Inc. and four of CVE’s staffing companies. Berger said that federal law requires all employers verify that workers are in the country legally with an I-9 form. ICE said an audit of those forms that began in January "confirmed numerous hiring irregularities." "In this case with CVE, we received many tips that they were hiring illegal aliens who were using fraudulent documents," she said. Berger, speaking generally and not about this case, said that immigration laws aim to ensure U.S. citizens and legal residents have a fair chance at getting jobs and that companies compete on the same playing field. In addition, workers hired illegally can be abused and exploited such as by being paid less or subjected to unsafe working conditions, she said.